We start with the tests being run on Wally West. He remembers ALL the variations in the time line, and those flashbacks of memory are driving him mad. Even the help of Zatanna, Martian Manhunter, and Jessica Cruz can’t get to the bottom of it all. Iris remembers a lot now that she has met her nephew, but it’s in bits and pieces – Wally is mainlining everything at once. He runs away to the places he knows best…but even some of those are mere illusions for now. The Flash Museum, for instance. Barry is frustrated that he can’t help his friend, and takes that out on a monitor in the Batcave (don’t ask). But, true to Barry’s nature, he cleans up after himself. Not so Hunter Zolomon. We get HIS story now, including he rejuvenation thanks to Eobard Thawne. They share a desire to make the Flashes suffer, though for different reasons. 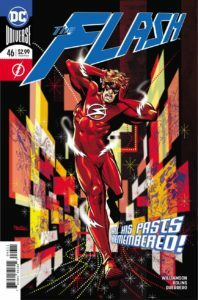 Zolomon believes he can “save” Wally by convincing him that changing time and preventing the tragedies that have already happened is a good thing. Thawne just wants to hurt Barry. Eventually Thawne leaves…and dies…again and again and again. Joshua Williamson’s story ties together some strings that have been hanging out there since REBIRTH began. That’s actually a good thing to me – so many of the DC “non-reboots” threw everything at us all at once, and letting things play out over time shows a lot more consideration and forward planning…at least on a few points. And, we get some reasonable motivation for Zolomon’s actions. It’s more than a little fun to put both of the classic Reverse Flashes together, even if only for a moment. For that, I’m glad to see this issue. My only quibble is that this seemed to be advertised as an issue that focuses on Wally. We DO get some early focus on his plight…but he is quickly shuffled off to the side. It is still a good story, just not what we had been thinking it would be, especially with the main cover. That said, if you got the alternate cover there would have been no doubt as to the focus of the story. I usually cheer for Scott Kolins’ art – and for the most part this is well done. There were a few pages that looked a bit rushed (no pun intended), but the overall work is fine. Overall, I’ll give this an 8/10 – but that’s just my opinion. What do YOU think? Leave your comments below! There are two things about this issue that puzzle me. Also, Barry’s wearing the infantino Belt?!? is this going to be a permanent change going forward?